Jan Bones was in town teaching at Tacoma Sewing and Design School. Whenever Ryliss brings a well known sewing instructor into town such as Jan & Kenneth, she invites anyone to join for dinner, even those who don't take the classes may join. Jan was teaching the dressform class again as well as a 2-day draping workshop (we did a 1-day in 2013). As always, it's just lovely to be in Jan's presence. She's kind, thoughtful, inclusive, and tells the cutest stories that melt your heart. We met at Harbor Lights, a local Tacoma Waterfront restaurant. They had delicious seafood and I even dared to eat Penn Cove Muscles. You see, I'm not really a fan of seafood. I like some things, but very little. Oddly, I love salmon sushi, Nigiri style! Most of the dinner attendees were taking Jan's classes. I met some really talented and lovely people! One woman is sewing lots of motorcycle jackets. Fascinating! Another lady told us about the lovely garments she made for her granddaughter. I love what happens when sewists get together. Especially the ones who have spent many years at their craft tweaking and improving. There's so much to learn from each one. 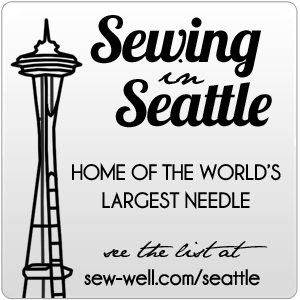 A lovely surprise was running into Leah of Away I Sew!. She and I took Kenneth King's Moulage class together. She's a very interesting and passionate person. She brought up great and controversial topics like sweat shops in LA and what we can do to help. This in turn inspired me to talk about Product Camp and Unconference Practical Theory of "Vote with Your Feet" introduced to me by Dave Manningsmith. We had a really interesting discussion about that, fabric stores, micro loans, and further on the topic of sweat shops and sewists in less than decent conditions. At Product Camp, all the attendees make up subjects, propose them, then the whole conference votes on them. The top votes become the subjects for each session. If you attend a session, but don't like it, "Vote with Your Feet" and leave. If you love it, stay! This principle applies deeply to our economy of which we are still seeing the effects. If you want to see something live, such as your local indie craft/fabric/etc. store, then spend your money there. If you choose to spend it other places, that's what you are "voting" to survive. I'm not saying one choice is better over another because we all must choose from our perspective. But I am encouraging you to consider that your money and how you choose to use it have ripple effects. For example, 2 of our anchor indie fabric stores in the US are now closed: Kaplan's Fabrics of Kansas City, MO and Josephine's Dry Goods of Portland, OR. (However, I just discovered that Josephine's was purchased and will re-open. This is fantastic!) Other indie fabric stores are starting, current owners wanting to retire, and possibly some business isn't as it once was. This tells me that people are choosing to spend in other places such as online shops or the newer, fresher stores. Hopefully you can begin to see that your money really does have an impact. Maybe not immediately, maybe not for years, but it does. So my dear friends, choose wisely and support that which you want to see perpetuated. Anyway, I digress! Back to Jan. Below is a screen shot of her patterns listed on her website. Please go look and get some. Her patterns are brilliant and full of useful tips & tricks that will change your sewing. I just finished some sleep shorts and kept thinking, "this woman is brilliant. My god. This woman is brilliant. Seriously!" Over and over. Blown away. Following suit with the "vote with your feet" principle, and knowing I want to support Jan's work to do what I can to keep her coming back, teaching and creating patterns, I took the money I paid for the class and spent it on Jan. I bought a couple more patterns - the hoodie and the shelf bra camisole. I also bought her necklines, collars, waistbands, and bust adjustment books. I am SO excited. Oh, and she had this rainwear fabric at Sew Expo that I couldn't stop thinking about. I got some of it too. I highly encourage you to explore Jan's patterns. Consider that she chooses to keep her costs down and ultimately the cost of the pattern to you by self publishing, self drafting, and packing all her patterns. She's pretty much a one-shop gal. The patterns are on a nice quality heavy-weight paper and they're chock full of awesome bits.